Resonance, in general, is the tendency of a system to vibrate more strongly at some frequencies than at others. A great example of this is a playground swing. 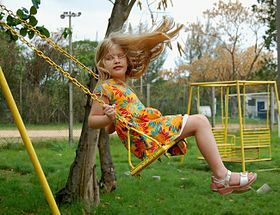 Like any pendulum, the swing “wants” to swing at a particular frequency, its resonant frequency. You can make yourself go higher and higher without a lot of effort — if you swing your legs at just the right time. Move your legs a little too fast, or two slow, and you won’t go any higher. You can stop yourself cold, just by swinging your legs at a “wrong” frequency. A similar thing happens when you sing in the shower. If you run up and down the scale, you will find that some frequencies are reinforced, and some canceled. It is much easier to make a louder sound if you are singing at the shower’s resonant frequency. Try it next time — pick your favorite shower song (One of mine is Englishman in New York — be yourself, no matter what they say) and sing up and down until you find a note that easily gets really loud. Then sing the song in that key. Resonance, in music, makes entrainment easier, which facilitates musical joy.